The cornea is a transparent window inside the body. 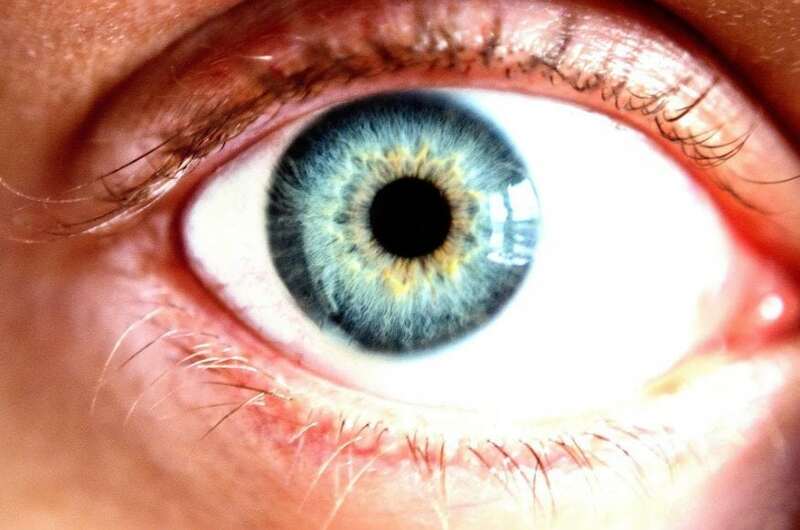 It transmits light into the eye and helps focus it onto the retina. The corneal endothelium is a single cell layer on its inner surface that is responsible for maintaining corneal transparency. By continually pumping water back into the aqueous humor, transparency is maintained through the precise spacing of collagen fibrils in the corneal stroma. Over a lifetime, cells in the corneal endothelium continually die and are not replaced, so the cell density slowly decreases. Beyond a density tipping-point, the endothelium is unable to function normally. This endothelial failure causes corneal blindness, and sight can only be restored through endothelial replacement. This is commonly achieved through corneal transplantation, though promising regenerative cell transplants are currently being developed. Until recently, corneal transplants have been full-thickness penetrating keratoplasties, but newer lamellar techniques such as Descemet’s Stripping Automated Endothelial Keratoplasty (DSAEK) and Descemet’s Membrane Endothelial Keratoplasty (DMEK) replace just the posterior cornea, including the endothelium and its basal collagen foundation called Descemet’s Membrane. Assessing endothelial viability is therefore critical to ensuring the success of these endothelial replacement techniques and the subsequent restoration of sight. These cells can be observed either in vivo using a specialized specular (reflectance) or confocal microscope, or ex vivo in an eye bank that stores corneal tissue for transplantation using a phase-contrast microscope. In vivo, a young healthy endothelium appears as a hexagonal honeycomb mosaic, but ex vivo appears more structurally complex. The endothelium has radically different morphology between apical (bordering the aqueous humor) and basal (bordering Descemet’s Membrane) surfaces, despite being only a single layer of cells 5µm thick. Eye Bank-stored corneas also tend to swell during culture, creating surface folds that make accurate imaging even more challenging. Until recently, the only measurement that could be obtained from Eye Bank-stored corneas with any level of accuracy was cell density. A key step in image analysis is segmentation, or the process of dividing the image up into measurable quantities, in this case corresponding to endothelial cells. Traditional endothelial image analysis attempts to draw a border around the cells using a process called ‘edge-based’ segmentation. Originally this was performed using planimetry, that involved projecting endothelial images and manually drawing around the cells, though quicker and more reliable computer-based techniques have since been developed. While this works fairly consistently for in vivo images, it is still dependent on image size and quality, due to the nature of the cornea and the type of microscope used. By comparison, ex vivo corneal endothelium is impossible to analyze using this method and has instead been more reliably analyzed using alternative “region-based” segmentation. Even in relatively poor images, this technique can be used by locating the cell centroids (geometric centers), which are then used to generate a centroidal Voronoi diagram or tessellation. This defines the regions closest to each point as a form of a proximity map. These regions can then be calibrated, and a large array of geometric and topological measurements derived from them that extend far beyond just cell density. While a range of endothelial measurements have been collected from earlier ‘edge-based’ segmentation studies, due to the labor-intensive process used they have been limited by small sample sizes of variable accuracy. 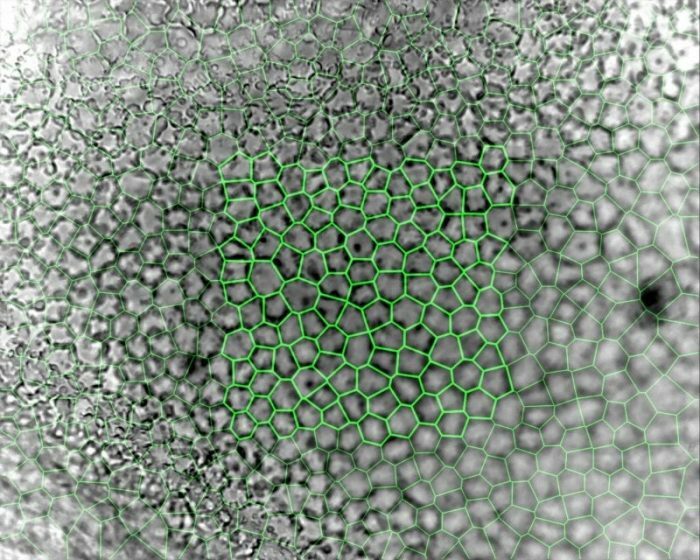 In contrast, employing Voronoi segmentation on a modern computer results in a veritable firehose of high-resolution data – the latest and largest dataset to date comprises measurements from 2000 images of Eye Bank-stored corneas, totaling 355,000 measured cells. The initial finding from this dataset was the similarity between the endothelium and a glassy viscous foam characterized by well-established physical laws. The basic laws of organization of groups of cells in a tissue were first identified by Joseph Plateau in 1873, who showed that the apical surface of the endothelial cells will tend toward equilibrium of faces and edges, and surfaces always meet in threes at 120° angles. At equilibrium, the tissue is at an energy minimum and cells tend to aggregate in clusters, where the surface area in contact with the surrounding environment is minimized. Endothelia in the dataset can also be described by Leonhard Euler’s characteristic (1752 – relating the number of edges, vertices, and faces of a convex polyhedron) that showed that in two dimensions the average number of cell neighbors tends to be six. These hexagonal cells were found to be regular hexagons independent of density through much of the range – a phenomenon known as self-similar topological coarsening. Similarly, the Lewis law (1926) predicted the linear relationship between the cell area and the number of sides, and the von Neumann-Mullins relation (1952-56) showed that a cell with more than six sides grows and a cell with fewer shrinks, with equilibrium being obtained by hexagonal cells. However, endothelial images analyzed in this dataset contained on average five different cell shapes, dispelling the long-held assumption that endothelia are purely composed of hexagonal cells, although this shape still dominated. Instead of signaling some form of pathology, this structural diversity may, in fact, be integral to endothelial function. Measuring the cell shape index (the dimensionless ratio of the cell perimeter to the square root of its area), cell and tissue phase was also examined in relation to the recently characterized “cell jamming” phase transition boundary (CJB). Cell collectives with shape indices above the critical value of 3.81 can move fluidly, yet at this point jam together as a solid mass like beans through a funnel. Other recent cell culture studies have shown shape index differentiating benign from metastatic cancer cells, and asthmatic from non-asthmatic airway epithelial cells. Endothelial images in the dataset showed fluid endothelia with a range of shape indices spanning the CJB, independent of density but dependent on hexagonal regularity. Each image contained cells with shape indices on either side of the CJB, with the largest proportion on the fluid side. Only cells with less than six sides had shape indices on the fluid side of the CJB. Interestingly, a plot of the all the cells in the dataset showed a distinct shoulder precisely at the CJB energy barrier, suggesting phase switching via shape transformation, with cells either side having distinctly different size and shape characteristics despite only small differences in cell area and perimeter. Combining these results leads to the possibility that the normal corneal endothelium may be dynamically balanced on the CJB. The centroidal Voronoi cell tessellation formed by the endothelial cells is a dynamic arrangement, so natural cell death will initiate an energy-intensive repositioning in order to maintain endothelial function. As the endothelium shifts toward its minimum energy state equilibrium, the cells tend toward more regular hexagonal shapes and simultaneously shift collectively closer to the CJB. This rigidity is an emergent property that efficiently locks cells in place, but in vivo this homeostasis will be continually opposed by other factors such as age, environment, genetics, and pathology. These findings are described in the article entitled Riding the cell jamming boundary: Geometry, topology, and phase of human corneal endothelium, recently published in the journal Experimental Eye Research. This work was conducted by Nigel H. Brookes from the New Zealand National Eye Bank and Department of Ophthalmology, University of Auckland, New Zealand. Nigel is a research scientist at the University of Auckland.